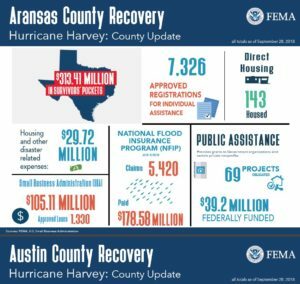 Governor Abbott, Commissioner Sharp, and others reflect on one year of recovery. As recovery continues in communities across the Gulf Coast Region and beyond, the State of Texas continues to work with our federal partners to cut red tape and secure more and faster funding. We are committed to working by your side for as long as it takes to help you rebuild critical public infrastructure in your community — roads, bridges, schools and other public facilities — damaged or destroyed by Hurricane Harvey or the flooding that followed. Through this site for officials from the impacted communities, we will continue to provide you with current, reliable information, to help you navigate state and federal resources and to celebrate milestones achieved. We encourage you to share information with your community about housing options through TexasRebuilds.com. We are grateful to serve the people of this state. Together, we will rebuild Texas—even stronger than before. Thank you for your interest in the Governor’s Commission to Rebuild Texas. Through this website, we provide resources and information to local entities and officials relating to the repair, restoration, and reconstruction of public facilities and infrastructure damaged or destroyed by Hurricane Harvey. If you are in need of individual assistance, please visit: disasterassistance.gov. For other questions and information, visit: gov.texas.gov/hurricane. General Land Office PREPS Hotline: 1-844-893-8937 (Toll Free) or 512-463-5330 for the hearing impaired. For help avoiding and reporting scams and price gouging, as well as tips for charitable giving, please visit the Texas Attorney General’s website. The Federal Emergency Management Agency (FEMA) also maintains a list with updates regarding specific rumors and scams.